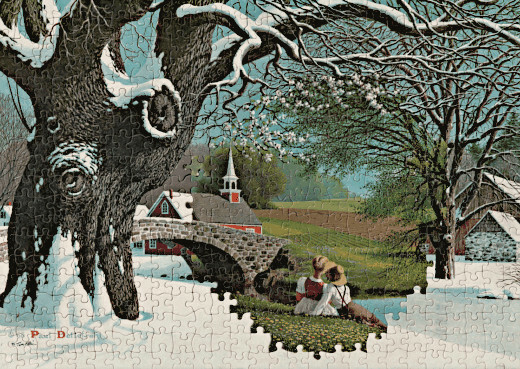 SUBHEAD: Artist uses jigsaw puzzles, with the same die cut pattern, to make these surreal mashups. 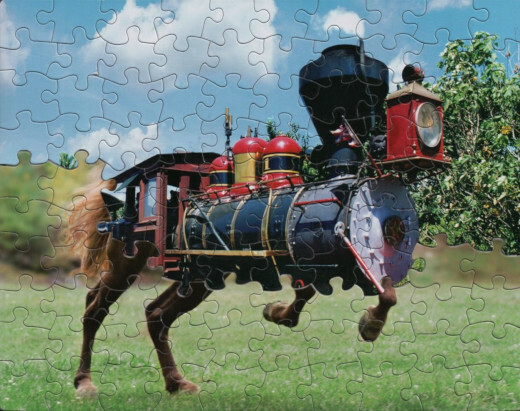 Image above: Horse meets train in surreal world. From original article. But my favorite montages are ones in which the whimsical is tinged with something a bit deeper, such as "The Mercy-Go-Round (Sunshine and Shadow)", in which a fairground carousel whirls riders around a church from the light to the dark and back again -- or "Surrogate", in which a strange hybrid of beer can and teddy bear opens its fuzzy arms and tells you to "consider yourself hugged". 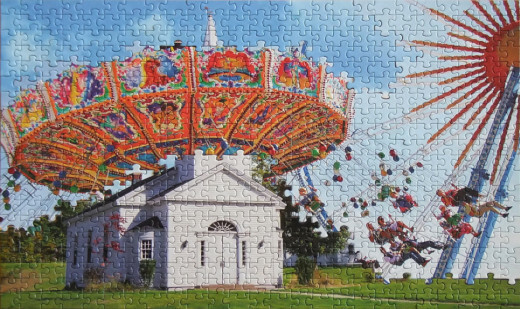 The imagery in jigsaw puzzles published nowadays tends to be very busy, often consisting of densely-packed collages constructed with Photoshop. 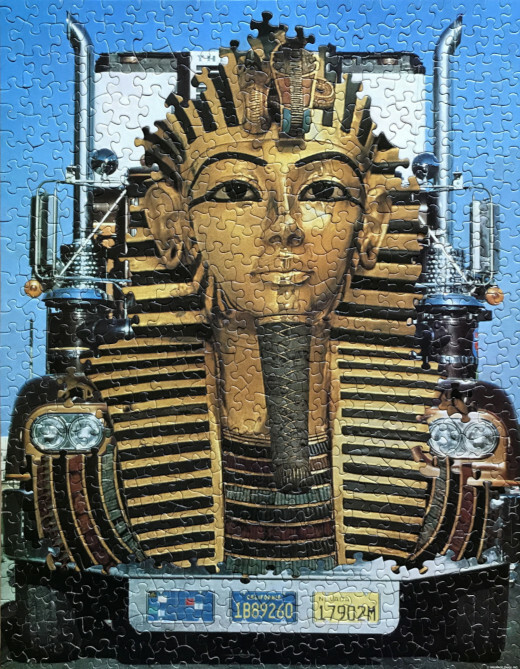 But for my purposes, I favor puzzles from pre-digital years, when the picture was typically a photograph of a single subject, such as a galloping horse or a ballerina or the Empire State Building. As I visit thrift stores and garage sales in search of vintage puzzles, I sometimes feel like an archaeologist, taking great pleasure in discovering and "reconstructing" strange, shattered images whose shards have been languishing in suburban game closets for decades. Image above: King Tut face on tractor trailer grill. From original article. Image above: Summer invades winter during global warming. From original article. Image above: Church goes far to attract worshipers. From original article.